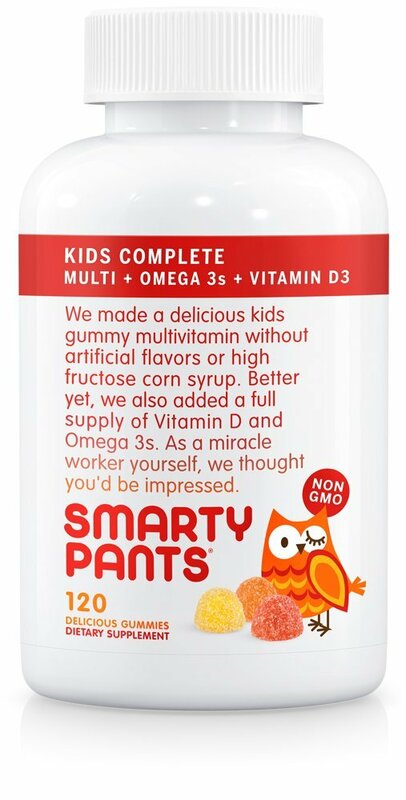 Home › Smartypants Kids Complete Gummy Vitamins: Multivitamin Vitamin D3 B12 (Methyl..
Smartypants Kids Complete Gummy Vitamins: Multivitamin Vitamin D3 B12 (Methyl..
NON-GMO. ALLERGEN-FREE. NO SYNTHETIC COLORS OR FLAVORS. GALAXY's BEST TASTING GUMMY VITAMIN! No fishy or vitamin-y taste because we spread our nutrients out over 4 gummies per serving. Size: 120 Count (Pack of 1) SmartyPants Kids Complete is more than a multivitamin. We're the galaxy's besttasting gummy multivitamin for kids. SmartyPants Kids Complete contains amultivitamin and omega 3 fish oil - all in one. We use premium nutrients, andinclude the forms of these nutrients that are easily absorbed by the bodywhenever possible. SmartyPants are non-GMO and allergen-free, with nosynthetic colors, flavors, or preservatives. Each batch is tested for purityand potency by a third party lab. For every bottle sold, we make a matchingnutrient grant to Vitamin Angels.